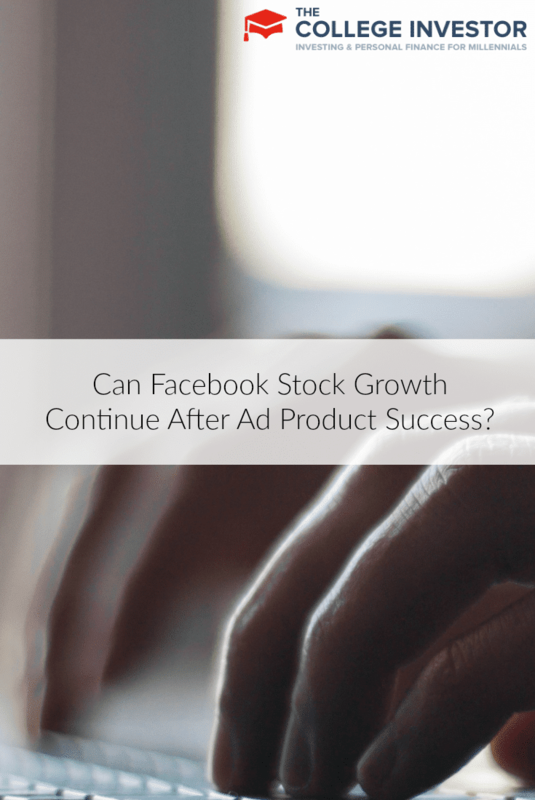 Home » Can Facebook Stock Growth Continue After Ad Product Success? At the 1-year mark, we checked in on Facebook stock, and looked forward to the future. Our big concern was what’s going to happen with Facebook advertisers. Well, Facebook (NYSE: FB) shares have steadily risen since mid-September from the low-to-mid $40s to current levels of over $50 per share. Positive news, increases in price targets, and investors rallying behind new prospects from further monetization of its users through advertising have all helped the shares rise. This is a dramatic shift from a year ago when investors were skeptical of Facebook’s ability to monetize their user base through advertising. Investors have lately started to focus on Facebook’s video ad product which the company announced in August and has started to lay the groundwork for. Facebook will have videos in users’ newsfeeds and has already started to test it. Analysts view this as a potential billion-dollar ad business and another way it can monetize on its 1.15 billion user base. Currently, only user-generated content is appearing in tests. The idea is to get the user comfortable with autoplay video and then introduce ads to this over time. However, there is a threat this will go one step too far and push users away from Facebook, reduce the number of visits to the site, or reduce the time spent there. Management needs to be cautious as to how they utilize video. Management is also looking to Instagram for new revenue generation. Instagram now has over 150 million users and plans to start selling ads over the next 12 months. It still needs to develop its strategy on what types of ads will work but the management team has succeeded with Facebook and should find a system that works on Instagram somewhat quickly. While estimates assume monetization in Instragram, there is some upside to the pace as it realizes this income over the next twelve months. The company also has Facebook Exchange where it offers newsfeed ads and dynamic ads. Revenue grew by almost 30% last quarter and indicators from outside sources that count clicks indicate the growth rate remains high. In addition, it generates even more value for advertisers in its dynamic ads that create custom text, images, and headlines based on the user’s profile. This generates 1.8x higher ROI than regular ads for the advertiser. According to metrics, case studies, and commentary at Adweek 2013 (held last week), Facebook is beating expectations. Advertisers noted the ROI on Facebook Ads is beating their expectations. Presentations from Wendy’s (NYSE: WEN), T-Mobile Corporation (NASDAQ: TMUS), and Anheuser-Busch (NYSE: BUD) all indicated strong ROIs and measurable direct sales benefits. Indications, according to attendees, were that advertisers and advertising firms were optimistic on what Facebook brought to the table. All of this will only go to increase demand and increase pricing power. Facebook’s key challenge is not becoming overly aggressive with advertising so that it detracts from the user experience. That could lead to declines in its base. While the stock has had a great run over the past year, upside may be getting more limited. Most analysts have a price target of around $60 per share. FB shares currently trade at 69.9x FY13 and 51.9x FY14 consensus earnings estimates. Consensus EPS is currently $0.72 and $0.97 for FY13 and FY14, respectively. Analyst forecast growth is around 35% again for FY15. All this said, social networking stocks like LinkedIn (NYSE: LNKD) trade at over 100x FY14 consensus earnings estimates, although the growth estimates are slightly higher. Current FY14 consensus for LinkedIn is $2.20 per share. Typically, for a stock with this risk level, a new buyer of the shares should look for at least 20% upside and it’s getting tougher to make that argument. An earnings miss or just not beating estimates one quarter could lead to a substantial pullback. Besides valuation, a decline in the user base is the primary concern. One quarter of negative metrics here could result in a significant decline in the share price. Users are always looking for the new things so will they find something new to adopt and reduce time on Facebook. Also, the increase in ads could negatively impact users and push them elsewhere. Facebook probably still has more upside and a few quarters before some of the key concerns really increase in risk. All indications discussed here seem to focus on how well advertising on Facebook has gone for advertisers. That demand is increasing and the company is increasing the number of ways to advertise and hence how much they can monetize from its user base. It will likely take a few quarters and a greater increase in the advertising presence for users to possibly rebel. That risk will increase along with the introduction of video ads. This is likely a bigger concern for 2014. The stock makes sense to own over the next quarter as advertising over the holidays in 4Q13 could beat expectations given comments at Adweek. However, investors looking to buy and hold for the long-term should take a deeper look. The long-term thesis to own has to include user retention in addition to ongoing sales growth. What is your current sentiment on Facebook? Will the advertising growth continue? Only time will tell! I would wait to see if they can sustain consistent earnings. I am not afraid to admit that I didn’t see it going well for Facebook, users are very resistant to change. I am still not totally convinced that they can sustain this as they are almost crossing the line on an acceptable amount of advertising and people will start to pull away. This is good news for Facebook investors! It’s truly interesting to know more about this details. Thanks for sharing. I’m just waiting for the next social media platform to appear and take out Facebook. Maybe that won’t ever happen though, I don’t know. I don’t use Facebook that much so I haven’t noticed what the ads are like. That is the question, will FB cross the line and have too many ads. FB did well because it had a clean simple interface that was easy to read and use. Will it lost touch with the reason it succeeded. The second risk is another social network taking its users. LinkedIn is doing well with professionals already. That said, people like to keep their professional and personal profiles separate. The question is more if the earnings growth is sustainable, not the earnings power, I would say that is firmly established at this point.